In some cases, words and actions can save a million lives. These activists had the foresight to record their conversations and protests, and these filmmakers had the foresight to know how to edit it to leave the power in the hands of those fighting. Scene from HOW TO SURVIVE A PLAGUE. Photo by Rick Reinhard. 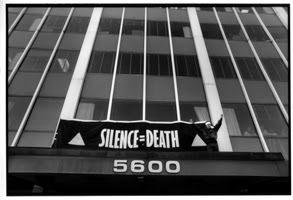 AIDS Coalition to Unleash Power (ACT UP) was formed in New York in 1987. Establishing Larry Kramer as its spokesperson was one of the many smart moves this advocacy group made. He’s well-spoken and he knows his facts. Approximately half-way through the film, Larry stands up and delivers a speech so Earth-shatteringly accurate, simple and poignant that the entire audience in the room and the entire audience for the film are left speechless. There are times during this fight where the group dissipates and internal disagreements arise, and even though a separate group formed, this community stuck together and the emergence of TAG (Treatment Action Group) just doubled their efforts and accomplishments. 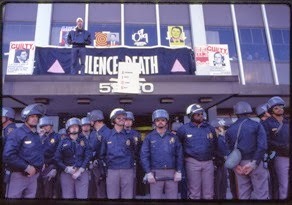 AIDS patient and homosexual activist Peter Staley was one of the heroes of the film and is likely a personal hero to many. At the beginning, he was young, passionate and out-spoken but he knew his facts and could beat any politician in a debate (spoiler: it’s somebody else who goes up against Bill Clinton). Just because he was gay, dying of AIDS and inexperienced doesn’t mean he doesn’t know what needs to get done and doesn’t mean he doesn’t know how to do it. Although these struggles took place 20 years ago, it’s still inspiring. Scene from HOW TO SURVIVE A PLAGUE. Copyright © Donna Binder. They fought against the Catholic Church and judging by the look on the Bishop’s face, they won. They fought against the FDA, and won. They fought against the NIH, and didn’t really win. They fought against President George H.W. Bush, and the result was basically pounding their head against a brick wall, but at least they made out on his golf course lawn. They fought against President Bill Clinton, and at least they learned their lesson about debating a Rhodes Scholar. More importantly, they learned that it doesn’t have to be a fight, and all advocacy, political and governmental groups worked in harmony. But by this time, it was indeed a plague and survival was the only option. The film had some fascinating facts but unfortunately they were written with a flickering green font on a grey cityscape background and were barely legible. But listen to what they have to say, and ACT UP and TAG will teach you “How to Survive a Plague”.